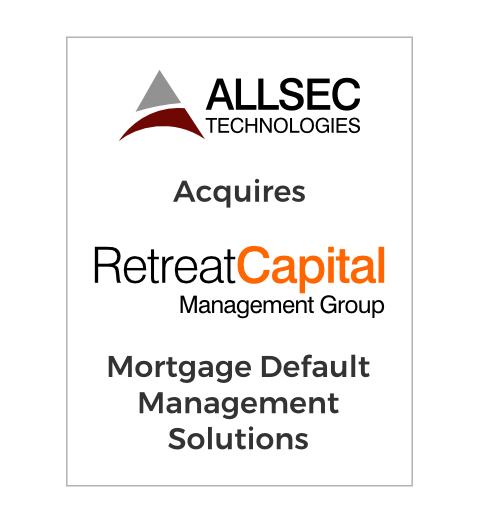 Technology Holdings is pleased to announce that our client, Allsec Technologies, has completed the acquisition of Retreat Capital Management, a full service mortgage BPO company headquartered in Irvine. Technology Holdings was the exclusive advisor on the transaction. Retreat Capital is an end-to-end provider of loss mitigation and portfolio management services for mortgage lenders, servicers, asset managers and investors. Established by industry professionals with over 25 years in the mortgage and real estate industries, Retreat Capital was created to serve as a single-source solution for reducing costs and mitigating loss at every stage of the mortgage process, from predictive modeling to processing through REO management. Allsec Technologies is a leading Business Process Outsourcing service provider headquartered in Chennai, whose investors include The Carlyle Group. Disclaimer. All products and brand names mentioned are trademarks or registered trademarks of their respective owners. All Trademarks remain the property of their respective holders, and in no way indicates any relationship between Technology Holdings and the holders of said trademarks.